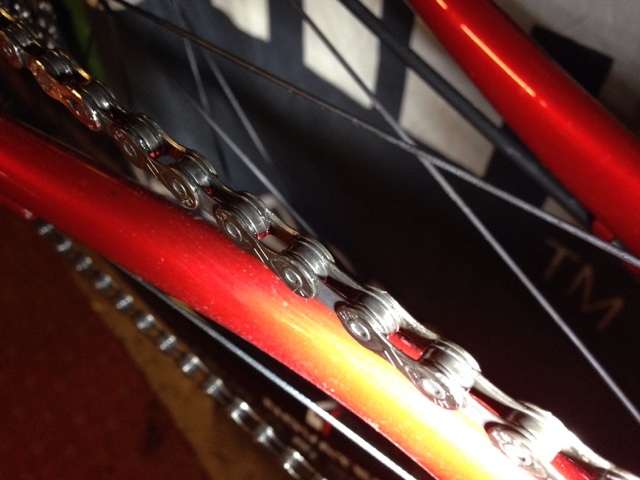 I'm really liking this Wickens & Soderstrom No.5 Chain Lube - this is on a new chain that's been out for 40k in winter, then cleaned. Note the line of darker fluid with black grit suspended in it, in the centre of each roller. That's the lube wicking the crap out from under the roller. It's magic. Based on previous chains after 3-4 cleans and relubes this disappears, and the chain cleans up first time. I know some folks like to just pour more on and say to never degrease - I disagree. The W&S lube lets you clean up easily using a mild degreaser (I use Swarfega Oil & Grease Remover, £8 for 5L at B&Q/Toolstation). Works a treat and its biodegradable. 'Rah.